Pomegranate is a round shaped fruit with juicy red seeds that have a sweet taste. The seeds, peel and aril of the Pomegranate fruit are all edible, but it is the juicy seeds that are often the primary source of nutrients. In addition to being a high source of fiber, pomegranate is an excellent source of essential amino acids, vitamin A, C, E, B5, B3 or Niacin, Iron, folic acid, potassium, and antioxidant polyphenols. These properties make pomegranate a great home remedy for many ailments. Pomegranate has been consumed for thousands of years due to its anti-oxidant, anti-inflammatory, anti-aging and other healing properties. Women have used Pomegranate for centuries for beauty concerns including wrinkles, acne, dry and saggy skin. Many studies have also shown that pomegranate may help with heart disease, arteriosclerosis, blood clots, weakened immune system, viral infections, dental plaque, erectile dysfunction and prostate and breast cancer. A few recent studies suggest that regular use of Pomegranate extract may slow the spread of tumors and cancerous cells. It is believed that the anti-oxidant activity in Pomegranate may induce apoptosis, a process which causes self destruction of cancerous cells. While a few studies have shown encouraging results in the treatment of cancer, further studies are still required to confirm these results. Nevertheless, in people with a family history of cancer, daily intake of at least 8 oz. of organic Pomegranate juice or a Pomegranate extract or oil capsule twice daily may help suppress the development of cancerous cells. The high amount of vitamin C in Pomegranate may help with flu and cold symptoms. Simply drink 1 to 2 glasses of pure Pomegranate juice diluted in one litre of water throughout the day. A few studies suggest that Pomegranate may expedite the oxygen supply to the heart muscles and help treat many heart conditions including cardiovascular disease, high blood pressure, and coronary heart disease. The anti-platelet activity of Pomegranate is also known to help with arterial plaque and blood clots. Therefore, simply drinking 8 oz. of organic Pomegranate Juice daily for at least three months may provide significant improvement in heart health. The antioxidant activity of Pomegranate juice may prevent and remove dental plaque and restore optimal gum health. Therefore a simple remedy for plaque and gingivitis is to use organic Pomegranate juice as a mouth wash or chew on one tablespoon of pomegranate seeds after every meal. 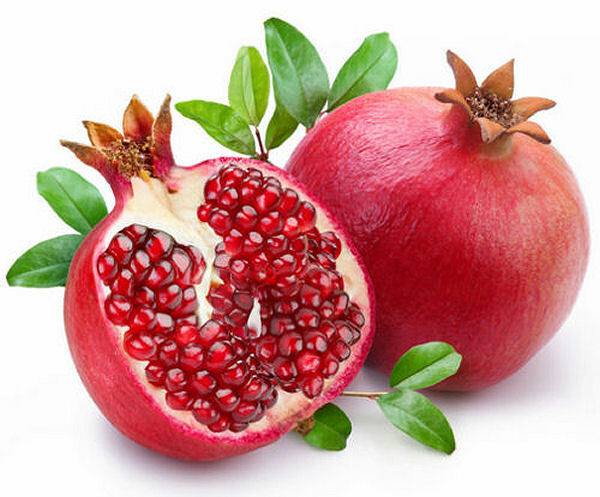 Pomegranate may help with erectile dysfunction by increasing and balancing the blood flow to the heart and subsequently to the rest of the body. Simply drink a glass of organic Pomegranate Juice or take one capsule of Pomegranate extract daily as a natural remedy for erectile dysfunction. Pomegranate is rich in potassium and polyphenols which may help with the restoration of cartilage in joints. Therefore, drinking a glass of organic Pomegranate juice or eating one whole Pomegranate daily can inhibit the onset of Osteoarthritis. Pomegranate is believed to help balance the estrogen level in women. Therefore, daily intake of a glass of pomegranate juice or a capsule of Pomegranate extract can help combat PMS and menopausal problems. The anti-oxidant properties of Pomegranate may contribute to the regeneration of skin cells and reverse the signs of aging such wrinkles and saggy skin. Drinking a glass of Pomegranate juice or eating a Pomegranate daily can reduce wrinkles and give a rosy glow to the skin. Pomegranate juice can also be applied directly to the affected skin for half an hour before a shower for a healthy and rejuvenated look. Pomegranate oil can also be mixed into your daily moisturizer to help maintain younger, healthy looking skin. What are the Side Effects of Pomegranate? Pomegranate is normally a safe fruit to eat when consumed in moderation. However, an overdose of Pomegranate seeds, its juice, oil or extract may cause diarrhea or upset stomach. In rare cases, some individuals can be allergic to the fruit. If you notice any sort of itchiness, swollen lips or tongue, or difficulty in swallowing or breathing, you should discontinue use and to consult your physician immediately. Fresh pomegranate fruit and packaged pomegrante juice can be bought at many grocery stores. When buying Pomegranate Juice, it is recommended to look for 100% pure organic Pomegranate juice with no added sugars. You can also find Pomegranate Oil and extract at many herbal food stores. Hi, Where is the cheapest place to buy Pomegranate juice? The local grocer charges $10.00 for a 48 oz bottle. Pomegranate juice could make you nauseous if you drink the whole bottle on an empty stomach. It is better to drink it throughout the day with food and a little diluted. Pomegranate is a natural immune booster and has anti-oxidant activity. It helps with a lot of health conditions. Love it! I usually don't drink pomegranate juice. I just drank an 8 oz bottle of POM and instantly felt nauseous. Threw up a little as well. I was thirsty on a really hot day and drank the whole bottle of Pomegranate over a couple of hours. But then had to spend thirty minutes on the throne. Now I know not to drink the entire bottle in one go! Thanks, very good information! Hope it will help me with knee pain.